On Friday, while webmasters were enjoying the weekend Google Web Spam team fired yet another bombshell towards them. 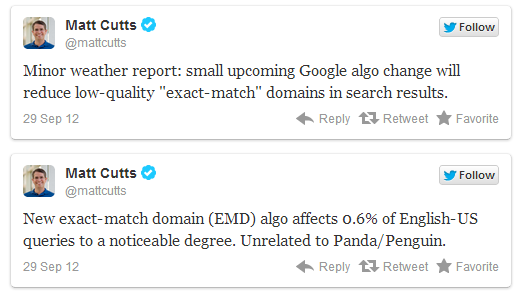 Google’s head of web spam department Matt Cutts tweeted that they have rolled out an algorithm update which was neither Panda nor Penguin because it was an EMD (Google Exactly Match Domain) Update. He also mentioned that Google is trying to eliminate “Low Quality” exact match domains from their Search engine. 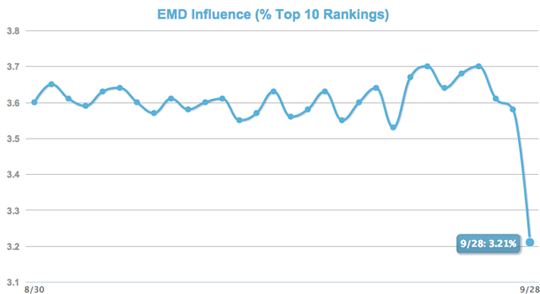 According to the early reports, “the EMD algorithm” affects 0.6% of English-US queries. However, it is not taunting refreshment, but you can expect more explosions from coming updates. 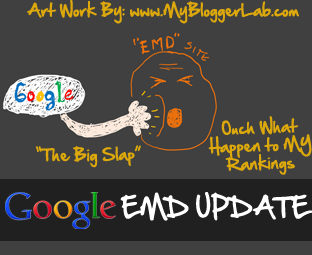 Today we will be discussing how EMD update can affect our blogs. Truly, I am bit surprised that Google had taken 2 years to do this. Actually in 2010 Matt Cutts told that, Google will keep an eye on exact match domains, but it took 2 years to implement which is pretty surprising. According to the early estimates, many webmasters have reported that they have seen a serious decline in their traffic. SEOMOZ have provided early results about the update, and it is pretty devastating for webmasters. Following is the screenshot which indicated that it was a massive update. The EMD stands for “Exactly Match Domain” which is a scintillating thing for those webmasters who purchases a domain that is exactly similar to a popular domain. It is common nature of human beings that they copy those aspects which are successful it doesn’t matters, whether they are negative or positive as long as they are providing benefits. Similarly, EMD update is to penalize those Domains which are replicas of Popular Domain. For Example, If a person purchased a domain i.e. Yahoo12345.com that is a complete replica of Yahoo.com then he will be penalized pretty shortly. Following is the screenshot in which Matt Cutt’s confirmed that the first EMD update is rolled out officially. The funny thing about this Algo is that you won’t be penalized until or unless you committed a blunder yourself. However, only those webmasters would be worried who have purchased an exact match domain to get quick exposure on search engines. Following are few quick tips that are helpful. Don’t Replicate other: To keep your site safe and sound from EMD Algorithm then don’t use the same set of keywords in your website. Quality forgives everything: Quality content matters a lot. Make sure you concentrate on building highly professional content to keep your selves away from any kind of algorithm refreshment. Seems like Google is happy with the way we are preceding. Alhamdulillah, MBL Blog has managed to pull off success in a real short period of time. We are proud the way our team responded to the uphill task and luckily we did it in the end. This EMD update have not uprooted our traffic instead we are witnessing a boost in our traffic in spite of losing all Pakistani visitors, because of Google service is banned inPakistan. What are your thoughts about the “Exact Match Domain” Algorithm refreshment? Give your comments till then peace, blessings and happy refreshing. Oh lastly Matt cutts gives us the great news. Thanks shayed for sharing this with us. Just because of Exact domain name .. mine traffic is getting decreased day by day .. HuH .. recently i've apply for a new domain .. do they have any contact system ? Thanks for this news, i think google is only want the original and unique stuff, this update is more effective for bloggers who receives so much traffic from EMD technique.